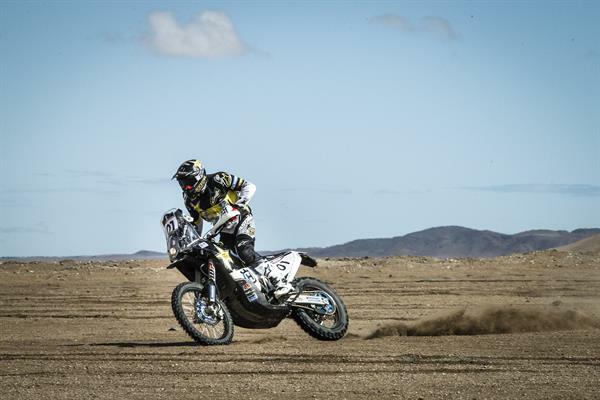 Putting in another solid performance, Rockstar Energy Husqvarna Factory Racing’s Pablo Quintanilla posted the fastest time in today’s timed special to claim a hard-fought stage three victory at the Atacama Rally 2017. Further increasing his advantage at the top of the provisional overall standings, the FR 450 Rally mounted rider now enjoys a four-minute and 58 second lead with two stages to go. Things couldn’t have gone any better for Pablo at this year’s Atacama Rally. Kicking off the event posting the fastest time in the short opening Prologue, he has now won two out of three stages so far contested in the Chilean countryside. Demonstrating he is back up to full speed following his recent injury in Qatar, Pablo now has his eyes set on Atacama Rally victory. Tomorrow’s penultimate stage at this year’s event will take competitors from Mejillones to Iquique. Including a 375km-long timed special, stage four will be the longest of the Atacama Rally 2017.